On 5 October 2017, the Special Economic Zone Authority in Duqm (SEZAD) signed a land usufruct agreement with Al-Wusta Cement Company to establish a cement plant in Duqm. The agreement was signed by H.E. Yahya bin Said bin Abdullah Al-Jabri, SEZAD Chair, Dr. Abdullah bin Abbas bin Ahmed, Chair of Oman Cement Company, and Ahmed bin Yousef bin Alawi, Chair of Raysut Cement Company. Under the terms of renewable 50-year usufruct agreement, Al-Wusta Cement Company acquired a land area of ​​500 thousand square meters in the heavy industry area to establish the plant. 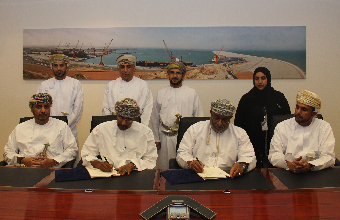 Al-Wusta Cement Company is the latest investment in the Special Economic Zone in Duqm (SEZD) registered as a limited liability company in partnership between Oman Cement Company and Raysut Cement Company. Al-Wusta Cement Company indicated that the construction work of the project will start in 2018 and production in 2020 with a capacity of 5 thousand tons per day that would gradually increase to 10 thousand tons per day according to market needs. It noted that the company's production of cement would contribute to cover the deficit in domestic demand, whether from the public sector for infrastructure or private sector companies and the company would export the surplus. The company expects the new project would provide many business opportunities for small and medium enterprises (SMEs) by activating the activities of auxiliary companies to produce cement, such as transport companies and rock detonation companies to provide raw materials from quarries to the plant. It will also activate the movement of companies operating in the field of loading, unloading, packaging and storage, in addition to stimulating construction companies. Al-Wusta Cement Company is the third cement production company in the Sultanate after Oman Cement Company, which last year produced 2.3 million tons of cement, Raysut Cement Company, which produced 2.3 million tons of cement from its Salalah plant and 1.4 million tons of its subsidiary, Pioneer Cement Company in Ras Al Khaimah.